This Lime Crime Carousel Gloss is something I’ve wanted to try for ages and I just couldn’t go past Cherry on Top, with its bright colour and glittery finish. The colour pay-off is pretty good and I didn’t feel like I needed to use half the tube to get an even coverage. That said, I’d seen other people say it lasts better if you put lipstick underneath it. I tested this with Tony Moly Kiss Lover lipstick in Summer Orange (for a lighter red/orange) and Australia Colour Inject Mineral Lipstick in Cha Cha (for a deep red). 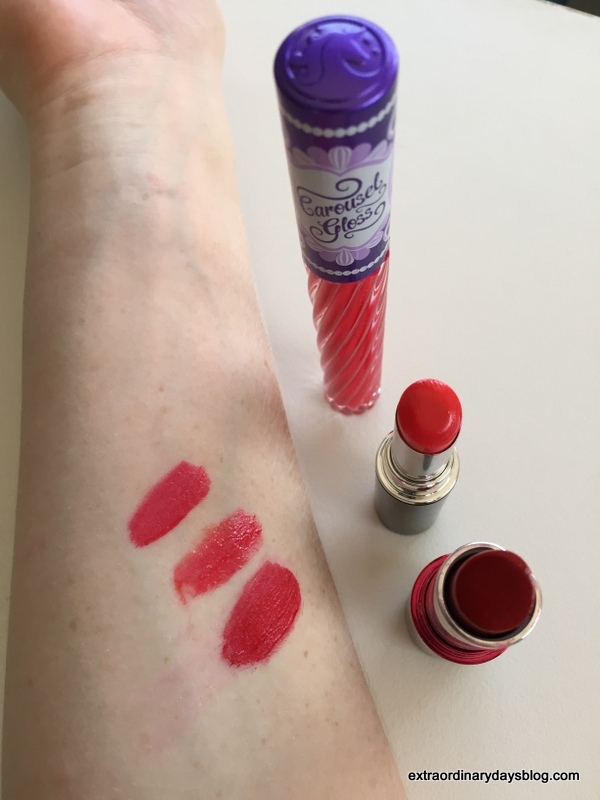 From top to bottom: Cherry on Top by itself, over Tony Moly Kiss Lover in Summer Orange and Australis Colour Inject in Cha Cha. Although the difference wasn’t that stark, I think it would stand the test of time and food to have a decent lipstick underneath. This lipgloss doesn’t feel too sticky (although I’ve yet to wear it out with my hair down and in a strong breeze!) and is a nice change to matte-look lip colours. This lipgloss isn’t too sticky. I still want to try the rest of this collection, which includes an icy white/blue glittery gloss (Snowsicle), a deep red (candy apple), a deep purple shade (Present) and, in a shade that’s not for everyone, emerald green (Hollygram). Keen for more red lip colour love? I wore the deep red Australis lipstick with an incredible black lace dress. 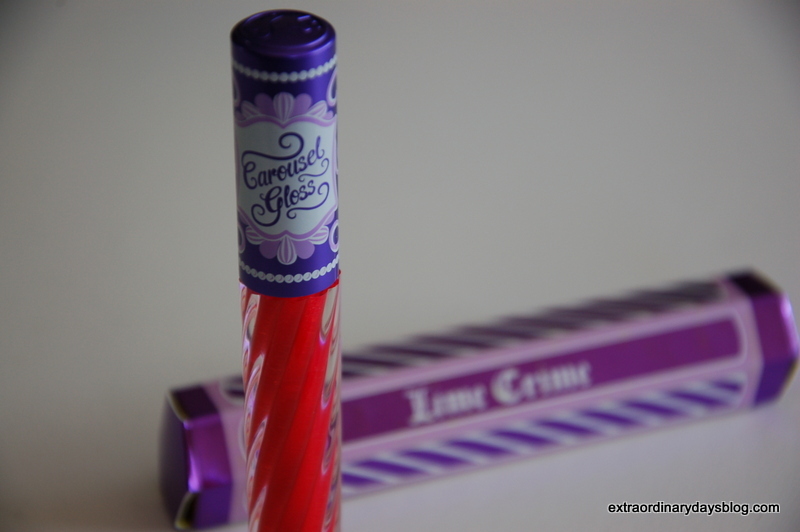 And did you catch my last Lime Crime review? I wrote about the awesome hot pink lipstick, Centrifuschia. This is a makeup brand I just can’t get enough of! 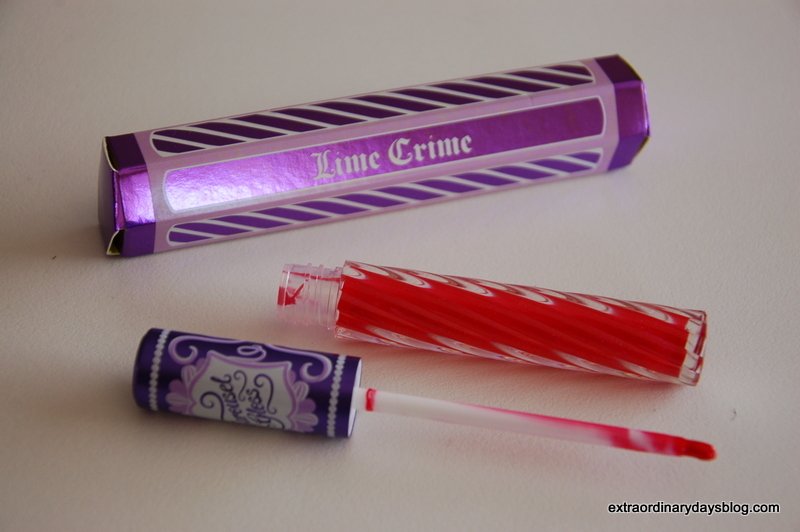 Have you tried any Lime Crime products? What did you think of it?